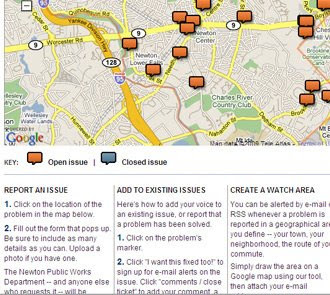 The Boston Globe was the first big paper to have a pothole map using SeeClickFix so we are excited to see the other types of issues that get reported in the Boston Area when they open up the idea to graffiti reporting and other issues in the public space as well. 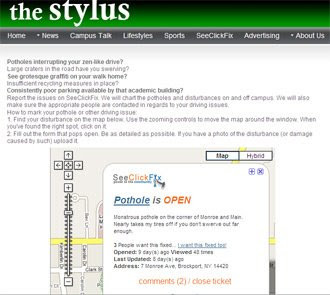 The Stylus -First College Newspaper to include SeeClickFix tool in site. Brockport is a College Town home to SUNY Brockport and as such their local paper is their College Paper. SeeClickFix met with Amanda Seef, Executive Editor of the Stylus, at the College Media Advisors Conference in NYC a few weeks ago and since then they have been working to include SeeClickFix in their site. ""I think it's a great thing for residents of Brockport," Off-campus representative Eric May, said. "It's a great initiative, and I would highly encourage everyone to use it." Other uses of the site are for parking issues, recycling problems, needed or improved pedestrian pathways and sidewalks, crumbling or deteriorating architecture, such as stairs and unsightly graffiti or housing in residential areas. Users on the site can create "watch areas," where an e-mail will be sent to those registered when a new issue is posted. Many officials create watch areas in order to track residents' complaints. As of Monday, there were four complaints on Brockport's page of SeeClickFix, which can be accessed through The Stylus Web site at www.thestylus.net/fix, or by going to www.SeeClickFix.com and entering Brockport, N.Y.
Of the four complaints, two are potholes, one is a bump in the road and the last is on-campus parking. One pothole, which is reportedly located on the corner of Main and Monroe, has been identified as a sunken catch basin. So far, three users have requested the disturbance to be fixed. Harry Donahue, the director of the Department of Public Works (DPW) commented on the logged item on the Web. "Looked at the SW corner of Monroe at Main and there is no pothole," he wrote on the site. "There is a catch basin right at the curb that has sunk down, which I will put on list of catch basins to fix."" We have always felt that SeeClickFix is a valuable tool for community members to anonymously voice complaints about issues which they might traditionally have been nervous to go to the police about. This is the first arrest that has been directly attributed to the SeeClickFix community and we're really excited that the New Haven Police Department is making good use of the data. NEW HAVEN- Today, members of the New Haven Police Department Tactical Narcotics Unit conducted an investigation into street level drug dealing in the Eld Street area of the city. Eld Street residents were instrumental in the investigation by keenly observing suspicious activity in their neighborhood and promptly reporting their observations to the police via the website SeeClickFix.com. Armed with the information received from Eld Street residents TNU detectives conducted surveillance, and a subsequent "sting" operation in the aforementioned area. At 2:31 pm, at the corner of Orange Street and Eld Street, detectives interrupted a street level heroin transaction. TNU detectives arrested both the alleged dealer Nelson Garcia (DOB 11/30/78) of 154 Canal St. and the buyer, Joseph Mazzucco (DOB 2/17/74) of 60 Rock Rd., North Haven. Detectives seized ten (10) packets of heroin from Mazzucco. Subsequently, Mazzucco was arrested for Possession of Narcotics, Possession within 1500 feet of a school, Possession of drug paraphernalia, Operating a motor vehicle with a suspended license, and Failure to obey a traffic signal. Detectives seized $1,060.00 from Garcia, as well as a 2010 Toyota Camry, and charged him with Sale of Narcotics. Both were remanded to the Union Avenue detention facility. No photographs are available at this time. Aside from embedding SeeClickFix in her campaign site here. to Report and Fix Neighborhood Problems"
"Within 24 hours of a posting on an interactive Web site(*seeclickfix.com), more than 100 people attested to the need to fix the situation, or at least warn people of the angled rail crossing. The state Department of Transportation has heard the complaints and is expected to have a report on it next month, according to its spokesman, Kevin Nursick." This is not the first SeeClickFix issue that has tipped off a newspaper to a good story and it reaffirms our belief that SeeClickFix is also a valuable tool for news leads. "The beauty, in my mind, is that it recreates Jane Jacobs’ concept of eyes on the street in a way that increases accountability on both a personal and public level. If one saw a problem before, it would be easy to either dismiss it (surely someone else has reported this) or simply not make the effort to call 311 in the despair that it is a complaint into an unresponsive void. With SeeClickFix’s widely available public record of problems noted by concerned citizens, it becomes difficult to ignore the many clamoring voices. Problems can be more easily identified, and solution-focused dialogue can take place among those living in the affected areas." This is not the first time Jane Jacobs has been referenced in conjunction with SeeClickFix. Jane Jacobs is most famously known for her 1961 book, “The Death and Life of Great American Cities” If you're interested to read more about Jane Jacobs, check it out here. 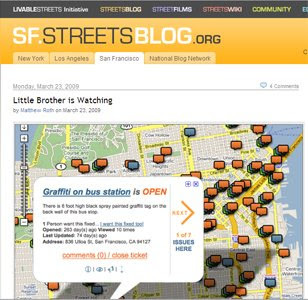 "In San Francisco, Phil Bronstein, the Editor-at-Large of Hearst Newspapers Division, is a big fan of SeeClickFix and is planning to use the mapping widget on SFGate.com. Kevin Skaggs, Executive Producer of SFGate.com, said that they have been preparing a collaboration with SeeClickFix since Bronstein blogged about them last year and will use the widget in a few months when they roll out their hyper local Chronicle sites, much like the New York Times' local blogs. 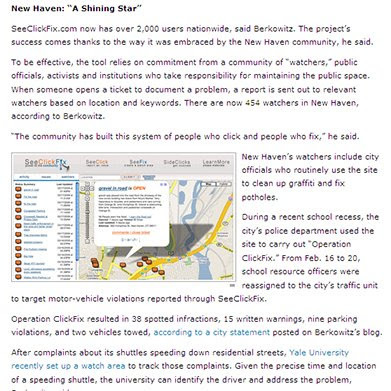 "SeeClickFix gives the Chronicle a way to bring ChronWatch online," said Skaggs. 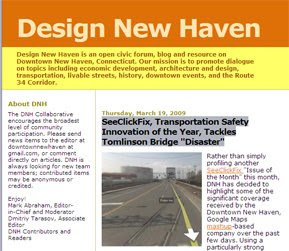 "SeeClickFix adds another way for the community to get involved in local media outlets." 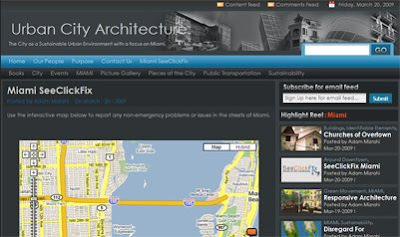 The SeeClickFix map was just embeded in www.urbancityarch.com. Adam Mizrahi writes on the post introducing SeeClickFix that, "
My goal is to keep an eye on Downtown Miami, Brickell, and the surrounding areas. Hopefully people from the urban areas of Miami will contribute to this growing tool. Furthermore, I hope other blogs in Miami begin using this wonderful tool. This will allow enough people to collaborate to bring credibility to the program and allow city government and institutions such as the Downtown Development Authority to join in. To me this seems like the perfect tool for the City of Miami and groups such as the DDA — Mayor Manny Diaz has always been in front of sustainable, urban, transportation, and technological issues. SeeClickFix, Transportation Safety Innovation of the Year, Tackles Tomlinson Bridge "Disaster"
Many Philadelphia Clickers awoke this morning to responses from their city government providing work order numbers for the issues that were reported on SeeClickFix through Philly.Com. 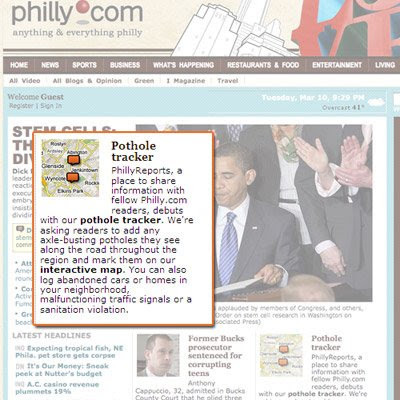 Updated 3/16/09 11:06am: The Streets Dept has received the request and created a work order of type: Potholes. A few weeks ago SeeClickFix hit Western PA on WPXI.com. This week its Eastern PA on Philly.COM. To put a SeeClickFix Map in your site go to http://www.seeclickfix.com/widget or create one from your watch area. The New York Times released their first 5 hyperlocal sites today named simply "local". SeeClickFix rss feeds are embedded in a few of the sites. You can find SeeClickFix issues on the lower right. SeeClickFix in the winner's circle on Ground Report. SeeClickFix for your political campaign site. Anybody want to help translate SeeClickFix into Spanish? Jeff was kind enough to make a little photo gallery from issues on SeeClickFix. There's some fun stuff. Add a photo to your issue to add some extra credibility and documentation!